I begin each week in the classroom with a Life Lesson. These lessons typically last five minutes, but my goal is to share with students some truth I hold dear. This week’s lesson: Little Things Add Up. Every year I collect pennies from my students and donate them to this worthy school. It’s a simple, charitable act with a larger purpose. Steve’s closing comment resonates with me. I love his extension of the penny metaphor to a greater truth. In my humble opinion, it is the small, daily acts that shape us…not big, extraordinary moments. If we aspire to be good students, teachers, friends, spouses, writers, jazz musicians, or dog trainers, what matters more than the rare monumental moments are the simple acts we complete almost without thought. Taking the time to compliment a colleague, standing up to a bully, or taking the time to use a semi-colon correctly carry epic weight when we total all of these gestures. The consistent attention we give to the small details matters. 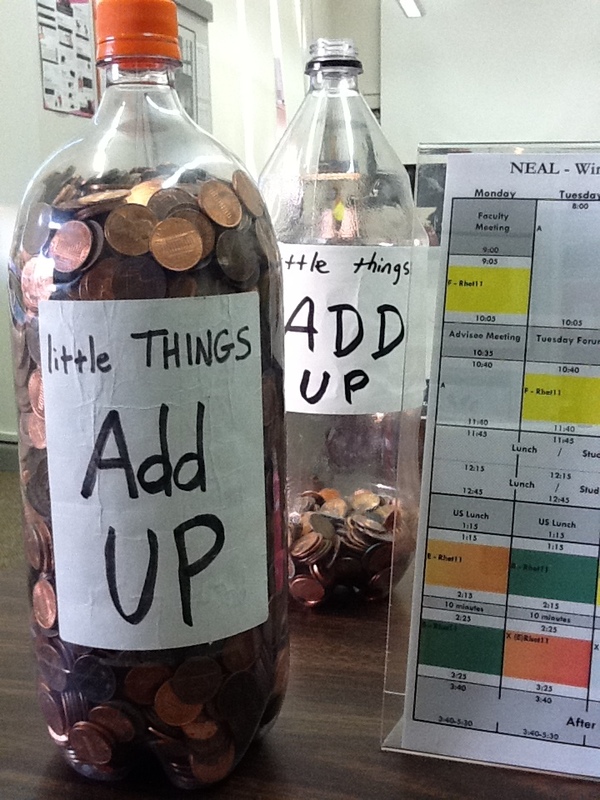 I use this video to encourage my students to make many good choices every day, and I ask them to reflect on what the metaphor “Little Things Add Up” means each time they make a small donation. If you don’t already carve out time to share a bit of yourself with your students, do. I have found that these quick moment…well…add up…in ways I can rarely predict. Students tell me these life lessons stick with them, and they often contribute lessons of their own. Working life lessons into your weekly routine is another concrete step you can take in creating a safe, inclusive classroom environment.